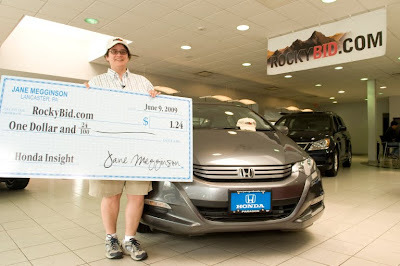 Jane Megginson just purchased a brand new Honda Insight Hybrid for only $1.24 from Rockybid.com! Do you want to know how she did it? Well first, you have to visit Rockybid, an exciting brand new auction website. Here you can participate in auctions on outstanding products (like a car or even a Gold Bullion) brought to you at unbelievable prices. But unlike most auctions where bidding is free, Rockybid charges you for the right to bid. What makes it fun and exciting to bid on Rockybid however is that you may end up bringing home amazing bargains like a brand new car at almost 99% off the retail price! Picture winning a nintendo wii for $0.99 or a Playstation 3 for $1.39! * The cost of a bid varies from 75 cents to as low as 68 cents. * Each time a bid is placed, the price goes up ether $0.01 or $0.15 depending on the auction. * Each time a bid is placed, the time extends by 15 seconds. * The winner is the last person to bid when the timer reaches zero. Don't fret if you lose on a particular auction for there are no losers at Rockybid. You will still earn credits from the lost bid which you can use to pay towards the purchase price of future winning auctions within 30 days. On top of that, this program rewards users with points which can be redeemed for gifts cards and other items. Currently available for American shoppers only, Rockybid is expanding to other countries throughout the world. Hopefully it will reach here soon so I too can start to bid, win and save big bucks with Rockybid! ;) ;) ;) Bill FC1! =-O =-O =-O Monica FC2! Recent blog:=- Let's Get it Started English Premier League! whoah! i should try this out too! ahahaha! Hi Marzie... checking in on Saturday night from the beach in Bay Head... Rex just took the girls (and his two grandkids) for a night walk up to the beach. I stayed on the porch to get a headstart on Music Monday and to see what's going on around the blogosphere... see you later! Recent blog:=- Music Monday Tribute to Billy the Lifeguard: "Who's Crying Now?"